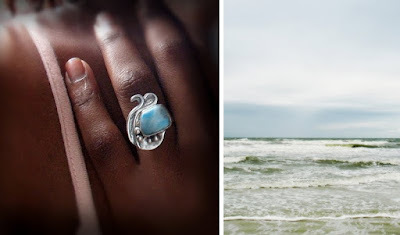 Recently I was asked to design a ring~ The ocean and the waves this fearless girl rides were the subject. This project stretched me as a metalsmith. The design was not born overnight, much time was spent getting it the way I saw it in my head (I'm especially fond of the reticulation). I loved every minute of it and I thank YOU for asking me to design something to symbolize your love of the ocean. It was my pleasure. 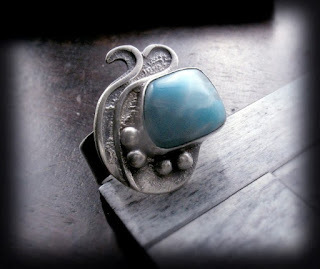 This is the Waverider Ring, constructed from sterling silver and larimar. The inside of the band reads "It's How You Ride It". It is ocean and waves...nice job Adrienne! Have a great week! You did a great job capturing the waves and ocean.